I Me My: Anna Karenina - Stoppard and Wright's Adaptation of Tolstoy's Mega Classic Fails to Impress. 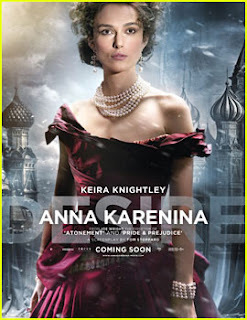 Anna Karenina - Stoppard and Wright's Adaptation of Tolstoy's Mega Classic Fails to Impress. Much as I didn't want to watch another cinematic version of Leo Tolstoy's classic novel Anna Karenina, I did. When the movie was released in 2012, I was intrigued by the fact that the vast landscape the novel rides through was to be captured in a theatre mould. However, the movie did not make waves after its release, and I soon forgot about it until the Oscars this year where Anna Karenina won the 'Best Costume Design' award. Having seen it this week, my resolve not to see another adaptation of Tolstoy's classic Anna Karenina stands resolute, even strengthened. I was impressed by the fusion of theater and cinema that Joe Wright brought about especially the scene where we along with Anna and the others watch a horse race on stage! However, this embellishment did little to redeem my interest in the movie which transformed Tolstoy's classic saga, his literary opus into a drama about a fobidden love that unfolds in glamorous Russia of the 1830s. Needless to say, Jude Law and Keira Knightly played out their parts well, but made no lasting impressions that would have raised the movie to the classic proportions of its literary counterpart. Bird Feeder - Showcasing Hunger Rules in Nature?